Henry Beard Delany is known for his contributions in architecture and for being the first African American bishop elected in North Carolina and the second in the United States. Delany was born on February 5th 1858 in Saint Mary’s, Georgia of slave parents, Thomas Delany, a ship and house carpenter, and Sarah, a house servant. Delany grew up in Fernandina, Florida where he received his earliest formal education. He and his brothers also learned brick laying and plastering trades from their father. In 1881 Delany entered Saint Augustine’s School in Raleigh, North Carolina where he studied theology. After graduating in 1885, he joined the college faculty, remaining there until 1908. He also married Nannie James Logan of Danville, Virginia, another St. Augustine’s faculty member, who taught home economics and domestic science. The couple had ten children including Sarah Louise and Annie Elizabeth who became famous with their 1993 joint autobiography Having Our Say: The Delany Sisters’ First 100 Years. Delany joined Raleigh’s Ambrose Episcopal Church, and in June 1889 was ordained a deacon of the church. Three years later he was ordained as a priest. He steadily rose in the Episcopal Church hierarchy, becoming Archdeacon in 1908 and Bishop in 1918. Delany also became active in the promotion of education among North Carolina’s African American population. He visited Episcopal, Baptist, Methodist, and African Methodist Episcopal (AME) congregations throughout the state, helping them organize schools for blacks. He was also one of the few education advocates who worked to bring educational opportunities to black prisoners in local jails. 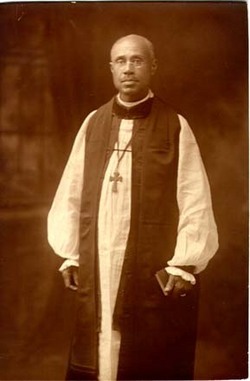 Because of his education work, Shaw University in Raleigh awarded Delany an honorary doctor of divinity degree in 1911. Although not formally trained as an architect, Delany designed Saint Augustine’s Chapel in 1895. This chapel is the only surviving nineteenth century building on the campus. He also helped in the design of Saint Agnes Hospital on St. Augustine’s campus in 1909. This hospital was, through the 1940s, the only African American owned hospital in North Carolina and the only one available to blacks in eastern North Carolina. The boxer Jack Johnson died at Saint Agnes in 1946 after being taken there following an automobile accident. Although not the main designer, Delany was the on-site architect and construction supervisor. Delany was also an amateur astronomer. Bishop Henry Beard Delany died in 1928 in his home on the Saint Augustine’s campus. His funeral took place in the chapel he designed.